Gigi's Thimble: Bulls-eye Quilt & a Sugie Cookers contest!!! You may have seen this picture before, under my 24-hour project post, but I really didn't focus much on the quilt I made for B's bed. I took a few more pictures of the details of B's quilt and wanted to post them in my finished product list. Here's the quilt. It's a raw-edge applique quilt in a bulls-eye pattern. It's very fun and very easy ~ a good one for beginners! B picked out his backing ~ the black and gold star fabric peeking out under there. I used up some left overs from the quilt and did a scrappy binding. I love left overs! For my labels I like to find a cute font from my computer and print out my name, city and state, and the year I completed it. If it's a gift then I also like to state who it's for. Then, I trace the letters onto my chosen fabric (muslin works nice) with a water soluble marker. Then I embroider over the letters using a simple back stitch. It clear to read and I feel like it's there to stay. In the past I've sewn the label on after the quilt is quilted, but I've heard it's nice to have it sewn on before it's quilted so that it can't ever be removed. If you don't want to spend the time to embroider then you can use a fabric marker too. I just like the look of the embroidery. This one was embroidered directly onto the quilt back, which I kind of liked. 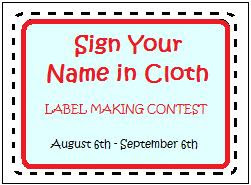 *You can only enter finished labels that have been made and sewn on to your quilts between August 6th and September 6th. (The quilts can have been completed prior to these dates, but only count labels that were made during this time period. You can even count the labels you sew on finished quilt tops that aren't quilted yet.) Sometime before midnight on Sunday, September 6th, leave me a comment telling me how many labels you completed during the month. You have to post pictures of your finished labels, so leave me a link to your blog, o.k.? * The labels can be made with embroidery, marker, ink jet printers - whatever. Just do what suits you! ** You'll get one entry into my contest for each completed label. * Contest ends at midnight on Sunday, September 6th - 1 month from now! * I'll announce the winner sometime on Monday, September 7th. * The prize ?!? will be some fabric. The winner can tell me what kind of style of fabric they want (i.e. Modern, 40's, Traditional, Christmas, etc.) and I'll surprise you with a little something that I think you will LOVE! Labels help to tell the story of our quilts and our lives to future generations. I like this quote from the book Remember Me by Linda Otto Lipsett, "It is not a woman's desire to be forgotten...And thus she signed her name in cloth." So go on and get busy making labels! No more mysterious quilts floating around o.k.? Hi Amber, I'd love to add your "button" to my post, but I can't figure out how. . . I'm a novice at the blogging. If you want to e-mail me steps, I'll add it to my BLOG. I won't have time to join the contest this time with summer almost over, and already behind on my responsibilities; but GREAT idea! You are one AMAZING quilter and you so inspiring me!! Love Blake's quilt. It is TOO cute! You did a great job in his room. I have visions of finishing my Americana quilt but am not sure if I can do it. If I do, I'll definitely do the contest!! I've wanted to do a label on Lily's quilt, even though it's already finished, so this might just be the motivation I need to get it done. Thanks! Hi Amber..loving this quilt and would also love if you carried the Sis Boom fabric!!! You are a sweet pea! !thanks so much!! What if you have no quilts to put a label on? Haha okay seriously though Amber when I asked for a giveaway... contest.. whateve.. I meant one that I might have a chance of winning. Okay I just had a thought what if I make a pillow for Louella's room and put a label on that would that count? Oh congrats on Ryan's job I just read about it. I want the details when we get home. See ya Sunday. I know, I know... I so need to make some labels. Just don't know where to start or how to get them on my quilt. Do you hand stitch them or do you use the heat and bond? Love your bull's eye quilt. I usually machine embroider my labels. Here is the only one I made in August for the 'In The Leafy Treetops' quilt along. You don't know me, but I stumbled upon your blog accidentally, getting here via 2 other blogs. I LOVE LOVE LOVE your blog after just a few minutes of looking at it. Your pictures are gorgeous. Your quilts are amazing! I LOVE quilts, but never find the time to make them anymore. You inspire me though, and I seriously want to make the bullseye quilt for my little boy. Where can I find the pattern? The highlighted link no longer works. I've put you as a favorite now. I'm a mom to 4 in Oregon, but will be moving to Rexburg, ID soon. My hubby's family lives in Utah, some in Cedar Hills, so maybe if I'm lucky, someday I'll be able to connect with you and come see your quilts in person. I would feel completely honored, and overwhelmed I'm sure. I LOVE your work! Oh, I love the framed "J" on the heading of your old blog. I want to do that for my family, since we're Johnson's also. Hey, Hey! I did it. Count me in!